I have always been drawn to pursuing more of a holistic and healthy lifestyle, full of natural foods and natural remedies. When ever I get a little sick you’ll find me on Pintrest finding the best suited remedy for me, whether that be for a cold or chest infection. From what I’ve found is that there is almost never a need to go to a Doctor or to pop pills. Though most remedies prove to be successful, I think prevention through a healthy diet and lifestyle is the best. Superfoods are pack with nutrients, they aid in anti-aging, promote better health and most importantly, help prevent chronic illnesses. When you hear of Superfoods, automatically we assume that we need to go spend excessive amounts of money at an over priced health shops but the truth is, you can find them almost anywhere and may even have some in your fridge already. It is highly important to first maintain a healthy and balanced diet that already consists of fruits, vegetables, proteins, whole grains and healthy fats. I promise you, adding kale on top of your Big Mac will be the least effective. Since I have become vegan, my understanding of food has completely changed and many food substitutes have naturally made me add more superfoods to my diet. I now drink and cook with delicious milks such as Almond milk, Coconut milk and my favorite Oat milk. I’ve also had to get my protein elsewhere and that’s lead me to the great spirulina powder and eating mass amounts of edemame beans. I also eat a lot more beans, seeds and nuts now. There are over 20 different types of tomatoes, my two favorites being Roma tomatoes and cherry tomatoes. Tomatoes are considered to be both a vegetable & a fruit. They are super healthy because they are full of vitimin A, C and K, as well as, vitimin B6, folate and thiamine. They improve digestion, blood circulation, protect the kidneys, detoxifiy the body and are great for both eyesight and blood pressure. I usually eat them as a snack, sliced up with a pinch of salt but also add them to every salad and I use them to make a pasta sauce. Truth is, a tomato a day is more likely to keep the doctor away than apples and this is one superfood that we all should eat more often. I actually purchased Spirulina powder before I even knew what it was. I guess, the name made it sound super holistic but once I did further research into it, I have fallen in love and don’t go a day without it. Most mornings I just have a simple shot of it mixed in water but the fact that it tastes like lake, may want you to put it in a Smoothie instead. Spirulina is a powdered form of blue-green Alge grown in fresh water, which explains its very distinctive taste of “lake”. It is an extremely high source of protein, filled with antioxidants and boosts your energy more than any coffee. It’s an anti-allergy, anti-inflammatory, anti-viral, anti-cancer, anti-anxiety and anti-fungal. It helps with aches and pains and dexotifies your body of heavy metals, that we natural take in by eating many other foods and especially arsenic. It is highly important that you purchase only organically certified spirulina as if it is not organic it may be grown in contaminated waters. I can’t begin to even tell you how much I love broccoli, it is one of my favorite veggies to eat and by the fact that it looks like a little tree means it must be good for you, right? When it come to any vegetables, I always suggest that you do not boil them! Boiling vegetables actually extracts most of the nutrients and so eating them raw, steamed or oven grilled it the best way. Broccoli detoxifies the blood, protects our liver and eyes. It also prevents cancer, cleanses the intestines and is rich in calcium. Be it winter or summer, green tea will always be a part of my life. Green tea helps you lose weight, reduces bad cholesterol, has a relaxing effect and promotes healthy cell growth. Truth is that all natural teas are great for your health and I love them all equally, there’s no discrimination here. Edemame beans are absolutely addictive, they’re just one of those things that if I see them, I have to eat them. Just be sure to make a wise choice of where you decide to eat them because once, I recieved a dodgy looking bowl of them at a Chinese resturant, i popped one open only to find a little worm boiled to death right inside it. Avoid any beans that have holes or marks. You want them to be extra fresh and green. I love to eat them with sea salt & soy sauce. Edemame beans are one of my sources of protein. They have manganese which aid in bone strength and arthritis. These beans can also cure asthma, prevent cancer and protect kidney function. Best of all, is they are deliciously satisfying to snack on. I’m still not entirely sure on how to pronounce this but Acai has become an absolute trend on all social media platforms and for good reason because not only is it delicious, it is also a superfood. Strangely enough, it is high in Omega 3 which is usually found in fish, it’s a great source of fiber and being high in calcium means it is great for your bones, heart, muscles and nerves. Acai is mostly used in pretty, purple smoothies but I’ve even put it in a home Made salad dressing and it was too delicious. Yes it smells…. Absolutely amazing!!! I add fresh garlic, and lots of it to almost every dish I cook. It is also one of the ingredients to many healing remedies. It’s best known to protect the heart so if you’re looking for a lasting relationship, choose garlic. To combat the smell on your breath you can simple drink a cup of green tea, chew some parsley or eat an apple. This superfood is a miracle healer, it is best known for its anti-inflammatory properties but has over 50 benefits! 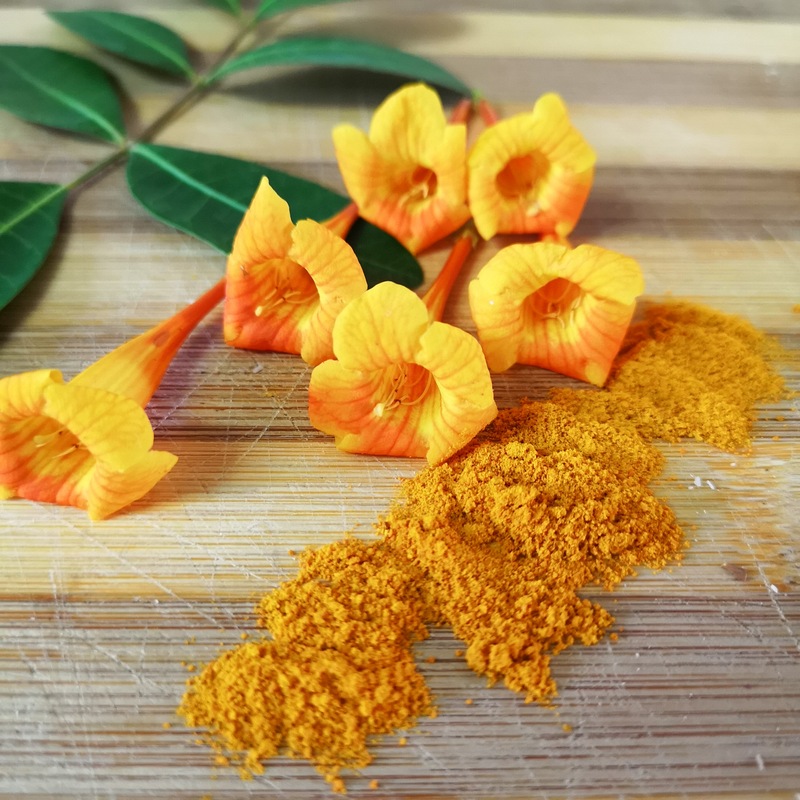 When eating Tumeric always do so by combining it with black or cayenne pepper this allows the body to absorb all its beneficial properties. I love to add it to my smoothies, into a face ask for glowing skin and also use it to get rid of period pains by simply mixing some powdered Tumeric with a few drops of water till its compressed like a tablet and I drink it with water. I recommend eating Tumeric religiously every day. Yet another superfood I’m still unsure of its pronunciation. Call it what you want buy chia seeds are always on the top of every superfood list and for good reason. Thesr tiny seeds found mainly in Mexico have such great health benefits that they were once used as a currency. Full of Omega 3 and antioxidants means that they are great for regeneration of skin and prevent further skin damage and aging caused by the sun. Miraculously they can reverse diabetes and are so beneficial for heart and digestive health. Chia Seeds absorb up to 12 times their weight in water, so I suggest lightly soaking them first and if not be sure to keep extra hydrated throughout the day. Almonds are a a great source of protein and healthy, unsaturated fats. They’re also used to make dairy alternatives such as Almond Butter and Almond milk. They also help lower bad cholesterol, promote brain function, strengthen bones, teeth and hair because of their calcium consistency. They’re a good energy booster and raw almonds are one of my favorite snacks, simple because they so easy to put into my bag. My love for coconut oil will never fade. I use it for many things in flying coconut pulling, cooking, moisturizer, as a hair treatment and to remove my make up. I even made an entire blog post about it which you can check out for all its uses and benefits. I choose to use 100% virgin organic cold pressed coconut oil, which is a little more pricey and for good reason. I recenetly experienced a horrific breakout, for a few months, which I’ve never experienced in my entire life and so I began adding a teaspoon of coconut oil to my gentle facewash in the morning and within a week my face cleared up like magic. These Superfood favorites of mine have not been chosen by me but rather by my body. These are the foods I crave more than others. Our bodies speak to us based on vitimin and minerals we may be lacking and it’s important for us to listen to our bodies. You may have noticed that half of my list consists of green foods. I recently found out that my liver has been under a lot of stress, related to anxiety and damaged lungs from smoking. Funily enough, after doing some research, green foods contain phytonutrients I need to detox my liver and lungs. This is probably why I crave them the most.